What to build, and why? Product Managers say their #1 problem is getting market feedback to drive their roadmap. Team members in Sales, Support, Customer Success and Marketing have valuable customer insights for what to build next. 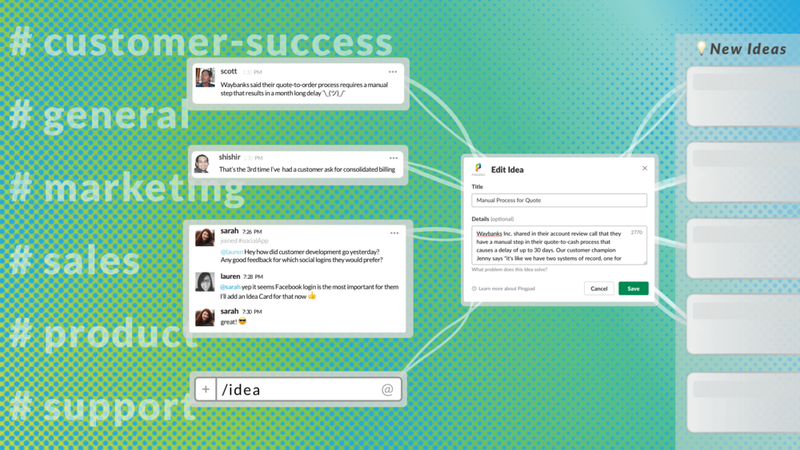 Capture the context of any Slack conversation, and quickly create Idea Cards. Having a process to define the problem means you can prioritize it, and you can build the solution faster. Idea Cards have a collaborative real-time document editor, focused Slack thread, file attachments, assignment, Custom Fields and more. Use a consistent visual process to prioritize which problems to solve. Idea Cards flow from Slack to the Idea Board. Create Lists and Custom Fields. Search, filter, sort and export. Automatically keep stakeholders in the loop. Focused messenger for Idea and Task Cards. 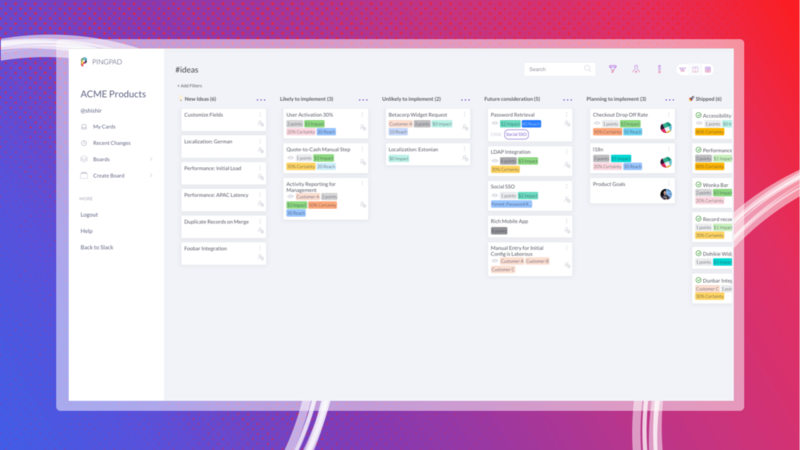 Cards flow to Jira or your Roadmap Board. Prioritize, plan, visualize and communicate your product roadmap. Gather cross-functional input in Slack and focus planning discussions. Visually prioritize and organize using Custom Fields. Make the plan accessible through Slack too, so everyone is on the same page. Pingpad's leadership team pioneered social collaboration, created the Enterprise 2.0 category, managed multiple collaboration products including Google G Suite, and architected and scaled SlideShare, the largest document website in the world. Pingpad is headquartered in Palo Alto and backed by leading VCs and notable angel investors. © 2016-9 All rights reserved by Pingpad Incorporated. Legal terms, privacy and cookies. Pingpad is not created by, affiliated with, or supported by Slack Technologies, Inc.